You must have an AO3 account to sign up. If you need an invite, please email bluechristmethmods at gmail and we'll get you set up! It's the same sign up for artists and authors. You can give and receive either art or fic. You get to make four requests, and at least one of them must be gen (meaning no romantic pairings!) This is to make it easier to match you. If you have any questions, again, email us at bluechristmethmods at gmail, comment at the bluechristmeth community, or send us a Tumblr ask. I know that you guys are already running your own Christmas Exchange but I just wanted to invite you to the Multifandom Christmas Exchange. We're looking to include as many people and fandoms and even if you don't feel like doing more than one Breaking Bad Exchange maybe there are other Fandoms that you're in that you want to produce something for. We're welcoming all Fandoms and all kinds of Fanworks. I'm just gauging interest in seeing how many people would be interested in a repeat of last year's Blue Christmeth fanwork exchange. If you want another hit of the blue, or would like more information, please read this. 81 icons - Orphan Black, Teen Wolf, Hannibal, Game of Thrones, Skins, Doctor Who and Breaking Bad. 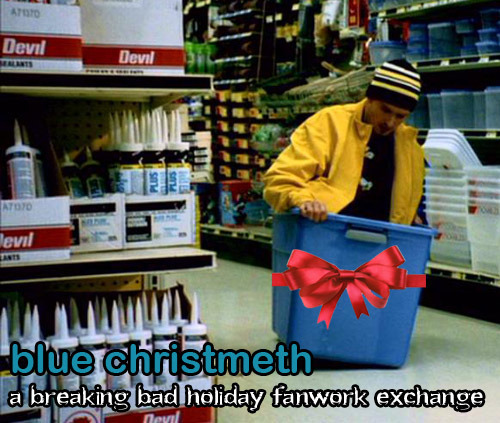 A followup about the remixers_lounge exchange: Breaking Bad did qualify as a fandom, and sign-ups are open now through March 30th! If you've written at least five 500 word or seven 100 word stories, you qualify to sign up. As I said in my last post, I'm not at all officially involved with Remix but it is probably my favorite fandom challenge, and I would definitely encourage everyone to check it out if they're interested! There will also later be a Remix Madness round that everyone can participate in, even if they didn't sign up for the main challenge. Also, there's a Mandatory Minimums community with prompts for those who might want to write a few last minute ficlets in order to qualify. I put up a few Breaking Bad prompts, and any AO3 member can also add prompts or fulfill them. To qualify in a fandom, you need to have written at least five 500 word stories or seven 100 word stories in that fandom. 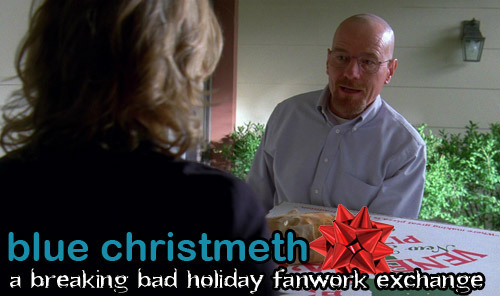 If you qualify in Breaking Bad and are interested in participating, please nominate it here!